- U.S witnesses an average number of 6 Million car accidents every year. - A number of people injured due to an accident in U.S count to be 3 million every year. - More than 90 people die in car accidents every day. - 1 out of every 7 people does not wear a seatbelt during driving. - Seatbelt reduces the risk of death by 45%. - Seatbelt cut the risk of serious fatal injuries by 50%. - People not wearing a seatbelt are 30 times more likely to be ejected from the vehicle during a crash. Distracted driving results in killing more than 9 people every day. More than 1060 people are injured in crashes that involve a distracted driver.1 out of 3 people are involved in texting while driving. You are 23 times more likely to crash while texting while driving. In nearly 1 out of 5 crashes in which someone was injured Distraction was reported as a factor. 40% of all American teens say that they have been in a car in which the driver used a cell phone while driving, and that put them in danger. Driving while using a cell phone reduces the amount of brain activity associated with driving by 37%. Sending or receiving a text takes a driver’s eyes from the road for an average of 4.6 seconds, the equivalent of driving the length of an entire football field blind. 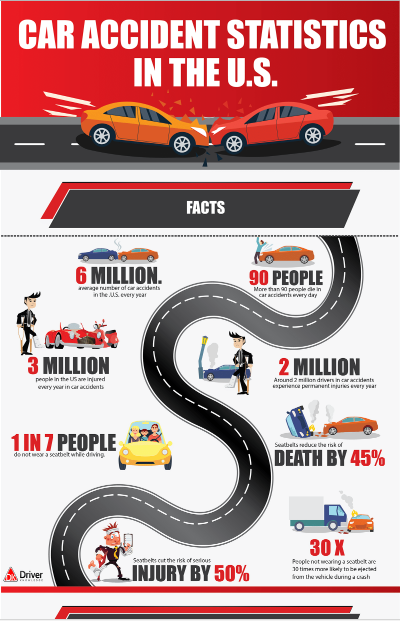 The below infographic by Driver Knowledge shows the car accident statistics in the US.